Happy days! My first-ever app—for the iPhone, iPad, and iPod Touch—has just appeared in Apple's iTunes Store. San Francisco Waterfront: Bridge to Ballpark, which I co-authored with Laurie King, is a guide to one of the most captivating city waterfronts on the planet. Offline content you can access at any time without an internet connection. In-app calling from your iPhone so you can make reservations, book tickets, etc. By the way, apps make a perfect "stocking stuffer" gift. Follow these foolproof directions to gift an app or to simply buy one for yourself. 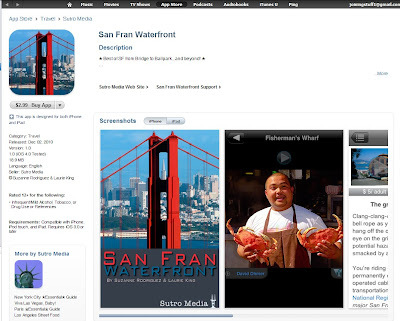 For more information, check out the SFWaterfront Facebook Page; click the "Like" button to stay updated on periodic news items about the ever-changing San Fran Waterfront. You can also learn more about our app by going directly to the app's description in the iTunes Store. You'll land on the page shown below (be sure to click More under the first heading, Description).